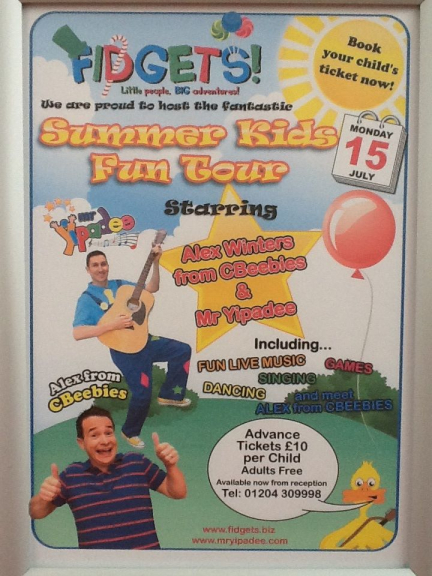 Fidgets Soft Play Centre, Bolton, have 2 very special visitors joining them on July 15th. There’s a fab visitor coming to Fidgets Soft Play Centre, Bolton this week. Alex Winters from CBeebies and Mr Yipadee are hosting the Summer Kids Fun Tour in Fidget’s very own café. Tickets are now on sale for Monday 15th July 2013. Fidgets will be hosting two shows: 3:30pm - 5:30pm and 6pm - 8pm. The two hour session will include a 30 minutes play session, a 45 minute show and a 45 minute photo opportunity/play session. Tickets are £10 and for only an extra £2.50 you can pre order a picnic box for your child to be ready when you arrive. Admission is strictly by ticket only and tickets are limited to avoid overcrowding so book yours soon to avoid disappointment. The café will be open throughout the evening though the reduced price of £2.50 for a picnic box (normally £3.45) is only applicable when booking your tickets. As one excited person pointed out on the Fidgets Facebook page, it’s like Robert De Niro visiting the co-op, such is Mr Yipadee’s and Alex Winters popularity. The show will be held within the café seating area. You will be able to supervise children at all times during the show and play session. Tickets can be purchased at Fidgets Soft Play Centre and Party Venue (Bolton) or by telephone on 01204 876691. Fidgets is one of the biggest indoor soft play areas in Bolton.